As UNSC Statement on Syria Opposes Attacks on State, Does UN Deem Assad More Legitimate than Gaddafi? UNITED NATIONS, August 3 -- After the Syria Presidential Statement was adopted by the UN Security Council Wednesday with Lebanon "disassociating" itself, Inner City Press asked Council President Hardeep Singh Puri why the investigation of human rights violations called for in the penultimate drafts had been dropped. Ambassador Puri replied that "there was an issue as to whom would do the investigation." Moments later when Inner City Press asked again, UK Permanent Representative Mark Lyall Grant acknowledged "there was a concern that Syria would be investigating itself." Inner City Press asked Lyall Grant for the UK's understanding of the PRST's call to refrain from "reprisals against state institutions." He said that "we do not expect to see attacks on state institutions, even from the protesters." On a second round of questions, Inner City Press asked Lyall Grant and the three European deputies with him, from France, Germany and Portugal, to compare this call with Libya, where they are supporting attacks on Gaddafi regime state institutions. Does this mean they -- and their PRST -- are deeming Assad as still fundamentally more legitimate than Gaddafi? Lyall Grant referred the question to French deputy Briand, even as he himself was asked to answer it for the UK. Briand said, "there is no comparison." Later a journalist questioned if he meant Assad is much more legitimate than, and cannot be compared to, Gaddafi. 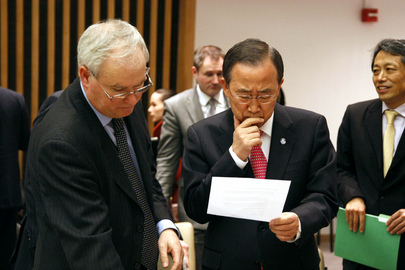 Later Secretary General Ban Ki-moon came to the stakeout. Inner City Press tried to ask him how he would provide the requested report or "update" to the Security Council in seven day if Assad does not even take his calls. But Ban's spokesman Martin Nesirky did not call on Inner City Press for a question, just as he did not following Ban's re-appointment to a second term, preferring then to call on UN Radio for a request for Ban's message to children everywhere. Beyond dodging questions, one again has to wonder about the wisdom of putting atop the world body an individual who can't even get his calls returned -- and then asking this individuals for reports about the countries concerned. To be continued -- watch this site.